The 2015 Bulldog football team celebrated its Class 5A state championship season Monday with its annual banquet at Artesia High School. Pictured above, members of the squad receiving special recognition pose with their awards. 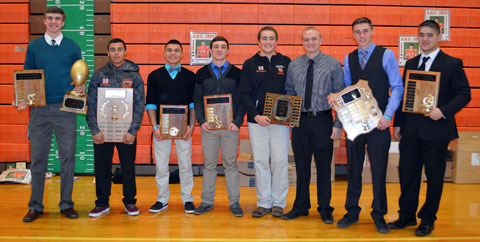 They are, from left, Justin Houghtaling, MVP and Leadership Award; Daniel Hernandez, Keith Butler Special Forces Award; Carlos Carrasco, Defensive Player of the Year; Ethan Duff, Offensive Player of the Year; Caleb Stubblefield and Chaz Matthews, Reese Hunter Award; Cooper Hall, Corey Tolle Fighting Heart Award; and Jacob Enriquez, Meacham Tackle Award.